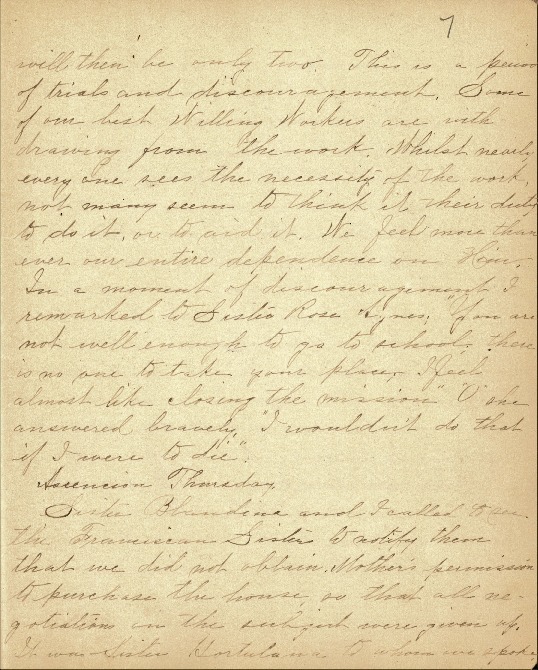 Document 11: Journal 2, Ascension Thursday (21 May), 1903, Santa Maria Institute Collection, Sisters of Charity Archives, Mount Saint Joseph, Ohio. Finding a site for the settlement that would provide sufficient space for confirmation classes, clubs, and a widening array of services was difficult because financial demands of a growing urban, immigrant population strained the resources of the Catholic Church and their religious community. The Santa Maria had fewer wealthy benefactors than some non-Catholic settlements. Sisters Justina and Blandina moved effortlessly between the legal and financial demands of operating the Santa Maria to comforting families and individuals coping with medical and economic hardship, responding in ways shaped by their religious faith. Deep compassion moved these sisters to respond to a variety of needy people, but they also believed that suffering and misery are mysterious and must be seen in a larger spiritual context. This approach contrasted to the emphasis on “scientific charity” among secular organizations during the Progressive Era. Ascension Thursday. Sister Blandina and I called to see the Franciscan Sisters to notify them that we did not obtain Mother's permission to purchase the house, so that all negotiations on the subject were given up. It was Sister Hortulana to whom we spoke. She told us that Mr. Bruhl, their lawyer, wished to break off negotiations, as we had delayed so long in answering. She also said to remain here until they disposed of the property. On our return home, we found Mr. Bruhl’s letter notifying us of his retracting the offer of selling us the property. It was a strange coincidence. We called to see Mr. Anthony Matre, the Secretary of the American Federation of Catholic Societies. He is a model Catholic gentleman. He takes an interest in all matters of importance to Catholics. Our object in seeing him was to ask his advice in adopting the best means to prevent proselytism among the Italians. It was Father Lasance who suggested it. Mr. Matre will do what he can in the matter. Returning home, on our way we stopped at Mrs. Cordesman, a neighbor. She asked us to see Ben, her sick brother. Poor boy, or rather, man! for he is forty seven years old, and he has been confined to his room, and to his chair, from infancy. He is deformed, blind, imbecile and helpless. He passes his time rolling papers for lamplighters using his left hand, the right one being paralyzed. His mother died about five years ago, her one great regret being the helpless condition of the boy she was leaving. Mrs. Cordesman, the boy’s sister, promised to take care of him. She faithfully kept her promise to the dying mother, and the helpless boy has the best of care, but what care can alleviate such misery. It is sights such as these that make us grateful for the great blessings of health. Mysterious suffering! but our good God knows best.